Identity theft has always been a concern, but with more and more details of our private lives openly accessible on the Internet, it's easier than ever for cybercriminals to steal somebody's identity — which is worth $5,000. Criminals are also getting more sophisticated and tech savvy, but sometimes, we do most of the job for them. After all, "password" is still one of the most popular passwords on the Internet. And there's no need to tell you why that's a bad idea. Also, according to the infographic below, created by NextAdvisor, 62% of smartphone owners don't protect their devices with a lockscreen password. Without it, whoever gets his or her hands on your iPhone or Android device might be able to access your Facebook, Gmail or even bank account. It's important to be careful what we share too. Some online services require us to provide personal details to reset passwords. Criminals can use this password reset method to convince the website that it's actually you and get into your account. 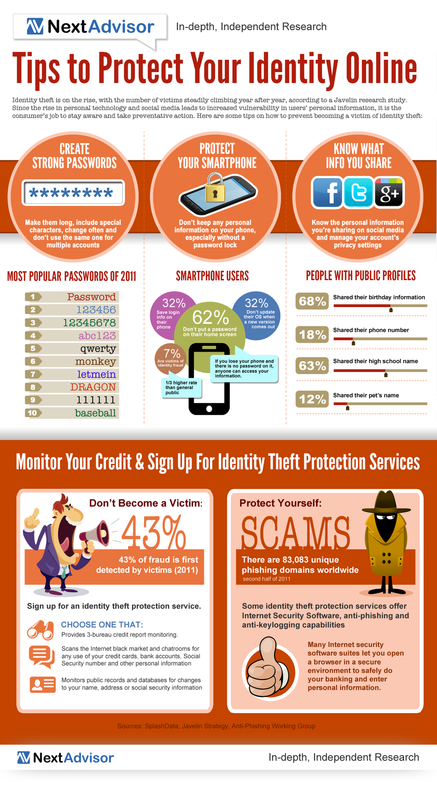 Take a look at the infographic below and find out more on how you can protect your identity online. Is Your User Content Online Legally Yours?